At ISN, we try to help international students studying at the University of Amsterdam (UvA) and University of Applied Sciences (HvA) integrate into Dutch culture while having a lot of fun! ISN Amsterdam is a section of the worldwide organization ESN (Erasmus Student Network), which is active in 37 countries. Every semester, we organize events and activities for over 1500 students. We are currently looking for motivated students (UvA or AUAS) who would like to work as committee members within a dynamic international, student-run organization. 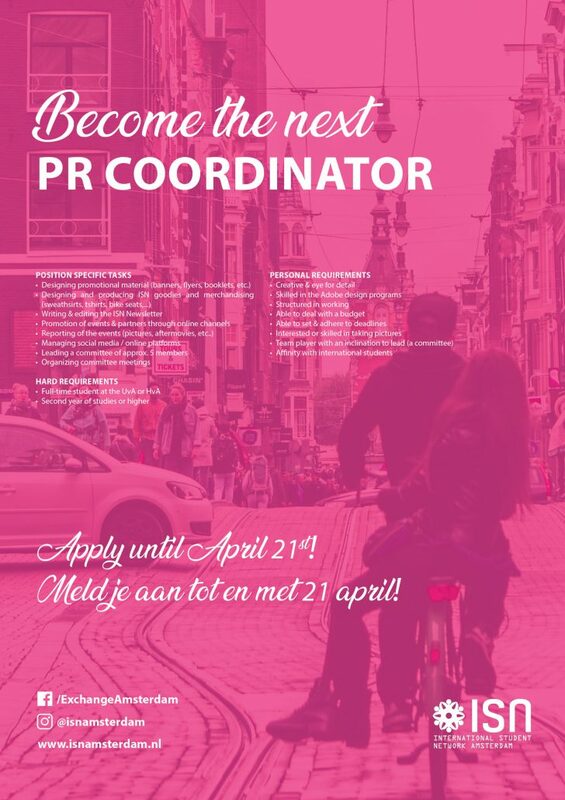 Joining our team as a committee member will allow you to broaden your network, gain experience in working within a professional, internationally oriented organization, get the opportunity to meet people from all over the world and, last but not least: have a whole lot of fun! Currently we are not recruiting committee members. Please keep an eye out on this page for future updates! Become part of the ISN Family! Apply now! Excited to make sure our newly arrived international students and exchange students have the best time in Amsterdam? You can help them out by organizing the Buddy Program and the Language Exchange Program each semester. Creating a Buddy Program each semester. Taking care of promotion, especially to recruit local buddies. Matching local and international students. Organizing a Buddy Meet-up and at least two Buddy Activities. Creating a Language Exchange Program each semester. Taking care of promotion. Matching students based on their language preferences. Organizing a Language Partner Meet-up. There is room for input from committee members regarding the activities and the organization of the two meet-ups. They can also think about organizing Language Cafés in place of our weekly De Bajes borrel once in a while. Have you ever had your own blog or website? Or would you like to experience how to manage a website? Do you have affinity with IT or apps? You always wanted to manage a database? If the answer is yes, then we are looking for you! The IT Committee is responsible for updating the website, developing the ISN App, building and maintaining our database and assisting the volunteers of ISN in tasks that are Information Technology-related. Currently ISN Amsterdam is starting with the creation of an ISN Amsterdam app, and as an IT Committee-member you will become part of it with your ideas! As a part of our team you will experience the development process from start to finish! You will learn how to work on a project as a team, you will get insight in a large student-run organization, and you will have a great time as part of our ISN Family while developing you own ideas and boosting your C.V.! ESN International has two projects that ISN Amsterdam participates in: Social Erasmus and Erasmus in Schools. Both of these projects are aimed at giving international and exchange students the opportunity to give back to and participate in the local communities they are (temporarily) part of. Excited to organize these volunteering activities? Join the Social Erasmus Committee! In the past we have, for example, volunteered at schools (e.g. language village), at nursery homes (e.g. Christmas decorating) and at soup kitchens. With your committee you will organize at least two of these types of activities per semester. There is room for input from committee members regarding the type of volunteering activities and events. This semester we are also looking into organizing a charity run. In the future this committee can look into ESN projects surrounding ExchangeAbility, MapAbility or mobility in general, as well as diversity projects at the university. Are you excited to show off Amsterdam and aspects of Dutch culture to our international students? Do you enjoy cultural exchanges and are you excited to organize activities that would facilitate cultural exchange? Join the Culture Committee! Organizing four Dutch Movie Nights per semester: choose four movies, contact speakers. Organizing an International Student Fair with student speakers each semester; with the committee you take care of all the details. Providing the students with several cultural activities to get to know Amsterdam, such as: Red Light District Tour, Johan Cruijf Arena Tour, Bike & Pancake Boat Tour and Boom Chicago. Next to these cultural activities there is room for your own creative thoughts and ideas – these could lead to the launch of clubs related to these activities, such as a museum club or a movie club. There is also room for input from committee members regarding the organization of the International Student Fair and regarding speakers, as well as for new types of activities that relate to either Dutch culture or an exchange of cultures, e.g. an International Dinner once in a while. You could also think of doing biking lessons at the start of the semester. Those who join this committee will spend their time thinking of fun and affordable destinations to visit, coming up with fun activities, booking accommodations, and creating budgets. Together you will work to organise trips that our (international) students will not easily forget. Being part of this committee offers you the opportunity to be creative and develop your social skills. It will test your team skills and endurance and it will also provide you with an unforgettable experience! The travel committee will consist of at least 4 students. The Partnership committee is responsible for acquiring and maintaining the partnerships with the various companies that ISN Amsterdam is/will be working with. It comes in handy to be outgoing & creative, having negotiating skills is a plus. Current partners include Student Talks, Coco’s, The BikeBoys, and Genki Sushi. You will work in a team with a focus on fundraising. This committee offers an opportunity to gain valuable experience and develop strong social and negotiation skills. Do you enjoy creating different types of formats (video, image, drawings) and would you like to see your work reach thousands of people? Are you a social media mogul who loves to use different platforms and knows the best ways to reach fellow students? Then the PR & Graphics committee is the place for you. Do you enjoy writing? Would you like to help fellow students discover Amsterdam by giving them interesting tips and stories on the city life? Would you like to want to help students keep memories of what is for many the time of their life? Then join the reporter committee! The Sports Committee consists of a group of at least four members who organise different events that are all sport-related. The sport activities that are organized during the year are the following: iceskating, surfing, the apenkooigym and the fun forest climbing park. Furthermore, there is room for your own creative and innovative ideas (such as a football tournament) which could eventually lead to a club or clubs that you have the power to launch. The most important job of this committee is to organise unforgettable sport events and to promote them as well. As a committee member, you learn how to organize different sport-related activities throughout the year. You are responsible for coming up with creative ideas, enthuse students to participate and taking care of additional tasks during the sports events. Furthermore, you work with at least three others, so you gain experience in working with a team as well. Are you a sports fan and do you want to organize sport-related activities for international students? Then apply for the Sports Committee! Do you see yourself as an event organizer? Do you want to contribute to international student’s social experience? Are you full of creative ideas and your problem solving skills are on a high level? If you answered yes to any of these questions, we are looking for you! Social committee’s aim is to make a more inclusive, positive and fun environment for other international and exchange students. This committee is responsible for organizing various events throughout the year. Ranging from smaller and bigger parties through social gatherings to organizing the Introduction Week! Social committee will consist of 5-7 members. In the committee you will function as an active member of ISN by making day-to-day decisions regarding the activities you decide upon. By joining this committee you will gain practical experience on event organization and teamwork skills. Are you interested in becoming a board member in 2019-2020? The application deadline is the 21st of April! To learn more join one or our information events! 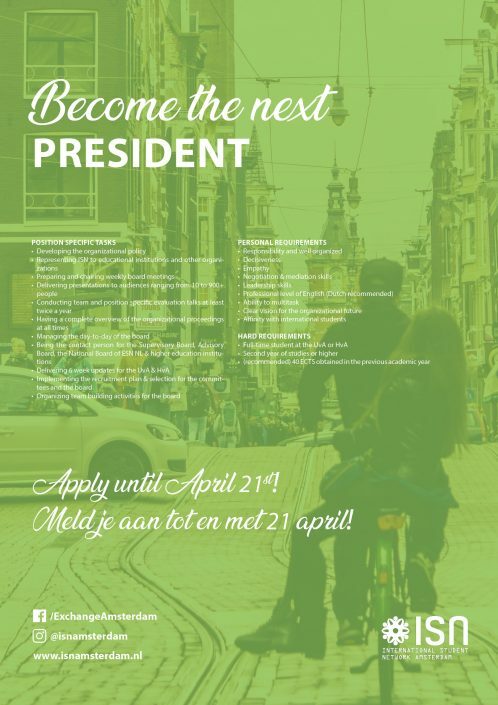 International Student Network Amsterdam is looking for students (UvA or AUAS) who would like to run a large dynamic international, student-run organization! ISN Amsterdam has started its final recruitment period for this academic year. Every new study year, a new board will be responsible for ISN Amsterdam. This period you will be provided with a great chance to become a board member and apply for one of our positions. A board membership within ISN Amsterdam gives you the chance to develop yourself and get practical experience next to studying. Do you think you are able to run one of the largest international student organisations in the Netherlands? Are you motivated to get the most out of your student experience in Amsterdam and are you looking for opportunities to build your CV and gain international experience? Then apply for a board position with International Student Network Amsterdam! ISN Amsterdam is an organization responsible for helping all international students studying at the University of Amsterdam (UvA) and University of Applied Sciences (HvA). ISN Amsterdam is a section of the worldwide organization ESN (Erasmus Student Network), which is active in 37 countries. We organize events and activities for 2500 students per year. Joining as a board member will allow you to broaden your network, gain experience in working within a professional, internationally orientated organization, get the opportunity to meet people from all over the world and, last but not least: have a whole lot of fun while working for ISN Amsterdam! A board member position is volunteer based and will cost you about 20 hours per week. As President of ISN Amsterdam you are the face of the organisation and you represent ISN Amsterdam in formal and informal settings on the local, national and international level of the larger Erasmus Student Network, and towards the affiliated higher education institutions (UvA & HvA) and the media. You need to be confident, socially capable, organised and a good public speaker. Do you get excited by the idea that in August 2019 you could be standing on stage presenting for an audience of 900 students and university officials? As the Secretary of ISN my responsibility is making sure that everyone is well-informed, and providing our volunteers with the right tools for their tasks. This includes managing the ISN website, responding to incoming emails, taking minutes & making schedules for the board, and monitoring the follow-up of actions. Besides this, I am ensuring that the foundation remains legally in order, writing the policy plan & reports for the universities, and sending out the ISN Newsletter. Currently, I am also leading the IT Committee with the development of the ISN application, super challenging! This position has a very varied set of tasks, nonetheless, it’s a lot of fun! Are you excited to take over my role? 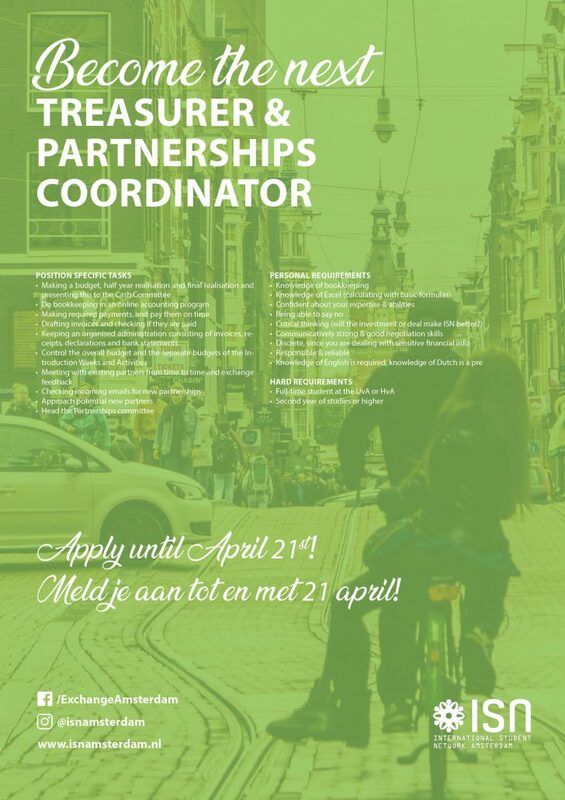 As Treasurer, I’m the person that manages all the money that flows within ISN Amsterdam. I’m responsible for, for example, paying invoices ISN receives for activities throughout the semester and the Introduction Weeks, making a budget at the beginning of the year that translates the policy plan and do the bookkeeping and keep an administration that comes with that. Besides that, the Treasurer is also responsible for ISN’s partnerships, both investigating new as maintaining existing partners. For this part of the roll of the Treasurer, you need to be able to lead a committee. The Funding Committee will help you find the best partners for ISN Amsterdam. Are you reliable, responsible, critical, being able to delegate and communicatively strong? Are you studying accounting or something related? Then you’re the Treasurer we need for the 2019/2020 board year! Do you think you can take over this role? As Activities Coordinator of ISN Amsterdam I am responsible for organizing the social and cultural activities that ISN offers. Amongst these activities are all the day trips to cities (such as to Volendam & Zaanse Schans), weekend trips (such as the Supertrip), sports activities, cultural events and the parties of ISN. Besides organizing events I create the official ISN calendar at the beginning of each semester, together with the Integration Coordinator and the PR Coordinator. I keep track of my own budget and coordinate my very own committee: the Activities Committee. The members of this committee are the support without whom I could not perform my tasks properly. Furthermore I make sure that the creation of Facebook-events is done properly in order to promote the activities. Being Activities Coordinator can lead to surprising situations, stressful but educational. I must say that this position has brought me everything I hoped it would, including the fun. Are you excited to take over my role? As the PR Coordinator of ISN Amsterdam you are responsible for all the promotional content you see on both our social media platforms (Instagram & Facebook) and around the international offices at UvA & HvA. This includes designing banners/leaflets with the help of Adobe design programs and distributing them in a timely manner (depending on when an event needs to be promoted) while being supported by the PR Committee. Furthermore, you will be responsible for writing & publishing the ISN Newsletter together with your Newsletter Committee. Are you interested in taking this role? Become the next Integration Coordinator of ISN Amsterdam! In addition to entertaining activities, travel opportunities and lively parties ISN tries to offer international students the opportunity to get to know the Dutch (student) community through several other programs and activities. As ISN’s Integration coordinator I am in charge of these type of activities. Specifically, I’m will be responsible for coordinating the Theme Nights and Dutch Movie Nights, the SocialErasmus and Erasmus in Schools activities, the Buddy and Language Exchange programs, the Dutch Culture Night and the sales of the Dutch Lessons at the start of each semester. Before the start of the semester, I plan all these activities to create the official ISN calendar together with the Activities Coordinator and the PR Coordinator. To be able to do this, I coordinate my very own (and very wonderful) committee: the Integration Committee. ISN’s Integration Coordinator should be someone carrying a welcoming smile and a lot of enthusiasm; good in not only communicating with fellow board members and committee members but with associates partners (for instance for the Dutch Culture Night, Dutch Lessons, SocialErasmus, Erasmus in Schools and Theme Nights) and most importantly: with the international students themselves! Already excited to take over my role and welcome the newly arrived students with the biggest possible smile? As Introduction Coordinator of ISN Amsterdam you are responsible for organizing the two introduction weeks at the beginning of each semester with between 700 and 900 participants. These weeks will be the first impression incoming students will get of our organization, this means that it is important that they succeed. Luckily you are not alone as ISN Amsterdam has two introduction coordinators. Together you will book venues, come up with activities, create a budget, manage the applications of students and recruit coaches.Planning and working together are important for this position. As the introduction week approaches the workload will increase exponentially. Luckily there are also relatively quiet periods. Next to the specific task of organizing the introduction weeks you will have regular board tasks as managing our office, guiding activities and attending meetings. You want to get in touch with (other) international students but you don’t have that much time? Then the ISN Volunteers Programme is the thing for you! Being an ISN Volunteer gives you access to the Mailing List in which you will be kept updated about activities for which we need help. This can be anything, from helping out during one of our events, joining our volunteering activities, to being a representative at a University Info Market. If you are interested you can be registered on our mailing list here. Your name will then be added to the Mailing List and everytime we need some help you will receive an email with details. It is non-commital, so only when you respond to one of our emails we expect you to actually help out. In short it means: lots of fun, a boost for your CV and everything on occassional basis!